Various elements of the capitalist system are busy conspiring away in their efforts to evict the Grangegorman Squat and gentrify the area by erecting a high-rise building in its place. But life rolls on in Squat City – spirits are high, the weather is awesome, and there’s lots of important work to be done and even more important fun to be had! And we want you to come join in. We’re happy to announce the opening of a new social centre at the Grangegorman Squat. It’s called the Violet Autonomous Space, and to start off it will be open every Monday from 6 to 10 pm, from tomorrow, 06/06/16. It’s named after Violet Gibson, an Irish woman of some note who not many people have heard of. She was an anti-war activist and she once shot Benito Mussolini, hitting him in the nose. It’s difficult to dig up a lot of info on her, so no one really knows why – and the main documentary source on Violet Gibson was written by a guy who seems like an awful dickhead, who didn’t seem to like women very much. There is an RTÉ radio documentary about her that’s quite good. It’s not easy to find on their website but here is a link to it. 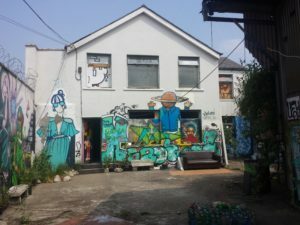 Dublin has been without a radical social centre for too long now. There hasn’t been once since first Seomra Spraoi and then the Barricade Inn stopped going. We learned loads from the successes and the mistakes of both of those projects. We’re staring it slow and hope to build from there. But that’s up to all of you good people out there, ’cause this is also a call to action – we want lots of people and groups to come and help make it a great space. The Violet will be an autonomous social centre, run cooperatively: everyone who uses the space will have a say, and a hand, in how it’s run. Drop by any Monday evening and see if it’s something you’d like to get involved in. Or just hang out and drink tea in. The Violet Autonomous Space is a two storey building with a nice sized little courtyard outside it, separate from the rest of Squat City. It’s a brand new social space so at the moment it doesn’t have the kind of stuff that Seomra and the Barricade had…yet! What it does have is tea/coffee making facilities, lots of seating and some exercise mats and stuff, lots of other bits and bobs around the place, and, most importantly, friendly people to have chats with! The Violet will be a place where people can hang out without having to spend money just to be there. It will be completely non-profit, we’re not interested in making money from it, we just want to have a social centre that people will want to be in and use, and host events and groups and classes, and be an absolute hive of community activity. So come help out or hang out, and help make it the kind of social space you’d love to see. Posted on 5th June 2016 5th June 2016 Categories Uncategorised1 Comment on Violet Autonomous Space opening tomorrow 6pm!